This light to medium shade brown mink collar is a custom made high fashion mid century lady's clothing accessory. This stand up cowl style collar was commonly worn to dress up and add elegance,richness, and warmth to a classic wool full length coat or 3/4 jacket. 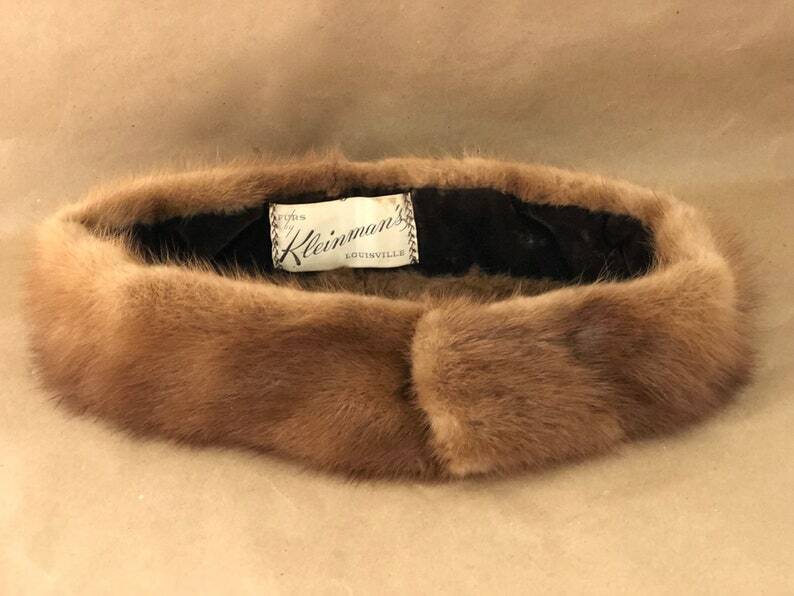 Its label tells us it was made by Klelnman's Furs of Louisville, KY who had been providing fine furs to wealthy Louisville ladies for 87 years when they closed in 2007. The collar is lined on its back side in a rich dark brown velvet fabric, is fitted with a covered hook and clip at each end, and is embroidered with the initials - JJA - of the customer for whom it was custom made. The collar measures 30" long x 3" wide and is in excellent in tact condition with virtually no evidence of wear.